01/10/2019 04/11/2019 - by Liam Weisman - 4 Comments. At the time of writing this review, Intel had released their new 8th Gen and 9th Gen processors code-named Coffee Lake and Coffee Lake R respectively. As you all know CPUs have a huge effect on overall desktop computer performance. For users who are going to be buying PCs with these processors, or PCs installed with any of these, they’ll have a dizzying amount of CPU performance for their daily tasks. The HP Pavilion 570-p030 desktop that we review today doesn’t offer any of the two CPUs. It sports a somewhat older CPU, the Kabylake processor (Intel Core i7-7700). Be that as it may, it is also a powerful processor capable of handling itself well in the face of impending home, office, and light gaming tasks. Despite the rollout of better processors in the Intel and AMD hierarchy, the HP Pavilion 570-p030 remains as a respectable mark in the PC space. That’s all owing to Kabylake processor and other well thought out components that, as we will see below, help it plow forward through daily tasks. Living in an era where processors chips, graphics cards, and motherboards get updated every so often can be confusing especially if you don’t follow the trend. Well, the innovation is all a good and dandy but it can also present a lot of challenges for users looking for a simple non-gaming PC option. The HP Pavilion 570-p030 desktop presents an impressive choice for users with simple needs that require little graphics intervention. 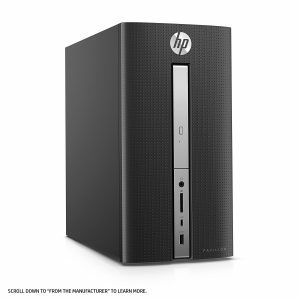 Coupled with a Core i7-7700 processor, 12 GB memory and 1TB Hard disk storage, the HP Pavilion 570-p030 is a must have for home/office users looking for a budget PC for general use. It’s a budget PC with no shortage of panache. Having a desktop at home for general use like watching movies, web browsing and perhaps even handling some work is important. And you don’t have to spend that much to won one. 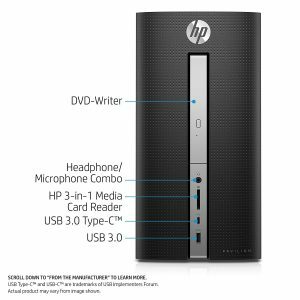 The HP Pavilion 570-p030 desktop is a mid-tier desktop packing the power and performance of a workhorse sub $700 PC and it doesn’t cost that much. That said, it doesn’t brag of a spiffier design compared to gaming desktops or even hulky features like some towers we’ve seen in the past. The design is a more toned down and modest but with a few features left for appeal. For instance, the front face has a rubbery finish, for comfort while carrying it, unlike most PCs with shiny matte surfaces. The rest of the case is all metal plates enshrouding the frame. Nothing too stunning or eye-catching but at first glance the all-black finish is decent. Moving on, the left side panel has a mesh-like vent to allow for airflow. 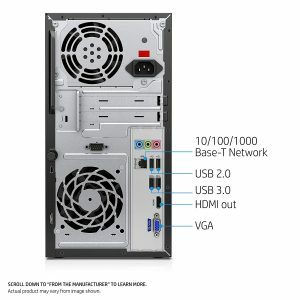 CyberPowerPC Gamer Xtreme Desktops offer better cases and bottom line better experience here if glass panels are anything to go by. Compared to CyberPower, HP’s metal door is a bit dull. Fortunately, that’s not a glaring tradeoff and has nothing to do with performance. Nonetheless, the side panel is easy to open. All you need is a Phillips screwdriver and a bit off expertise handling a driver. You’ll need to remove the screws at the rear before tinkering with the interior. On the whole, I find the HP Pavilion 570-p030 aesthetic wanting in gaming standards (of course) but purely appealing for casual use. There is enough space for upgrading should you ever want to. Also, the cabling is well done to allow going around it. As for the ports you’ll find outside, HP spared no expense. The unit is fitted with a single USB Type-C port withThunderbolt capabilities. That adds a nice touch to this PC making it future proof and relevant for use over at least the next five years. The front also sports a DVD-RW drive, headphone jack, microSD slot, and USB 3.0 port. The rear houses audio in and out jacks, Ethernet connector, 2 USB 2.0 for connecting to your keyboard and mouse and 2 USB 3.0 ports. For external monitor connection,s there is a single HDMI out and VGA connector. You can easily have a dual-monitor setup with this system if need be. Also, an all-in-one printer can be connected using the USB 3.0 port here for home or office use. Overall, there might excessive but the port system is just enough to plug all your general use peripherals and offer high-transfer speed options too. Notably, HP includes a complimentary free wired mouse and keyboard on board to get you started. They both are just basic and can be replaced if you spend a lot of time on your computer and need better user experience. The sister HP Pavilion 570-033w also offers similar features including USB-C port, Intel Core i7-7700 processor and 16GB memory. The two almost have on par on-paper specs but the HP Pavilion 570-033w offers more memory (16GB). 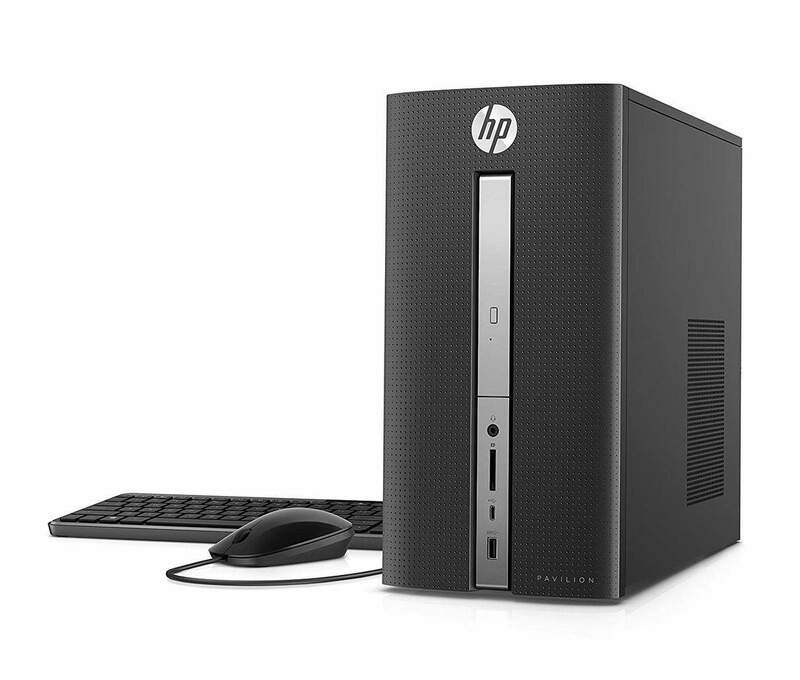 Also, there is the HP Pavilion 570-p020 desktop, a configuration of our unit with slightly less powerful features. It packs a Core i5 processor, 8GB RAM, and 1TB, HDD. Given that the HP Pavilion 570-p030 has no dedicated graphics card, toned out muscular features or even esport-centric specifications, it would be right to say that it’s not a gaming machine. Yes, that’s right. You won’t be able to frag your enemies in modern AAA gaming titles or edit graphics intensive video and images. That’s because it wasn’t made with that kind of raw power. But if you’re willing, it is customizable with a few tweaks here and there. I won’t get into how adding a power supply and upgrading to a new graphics card should get you there because it’s price tag defines its purpose as a general use PC. Anyway, don’t confuse what I just said to mean the system is weak. Not at all. The toned down stylish aesthetics coupled with the moderately powerful specifications to accomplish its tasks. The Pavilion 570-p030 is outfitted with a Quad-Core Intel Core i7-7700 processor a powerful CPU that handles 4K video remarkably. Additionally, the CPU comes with improved shift technology that enables it to adjust the CPU clock and supports Optane technology (a revolutionary technology for that improves performance on high-end SSDs). Beyond the subtle design is also the 12GB DDR4 memory that works alongside the processor. Usually, for desktops in this price range, you get 8GB DDR4 memory so this is a deal. Together the two deliver solid mid-level performance. The system handles multitasking, web browsing, multimedia and a bit of image and video editing. Of course, trying to edit large chunks of media or simply graphics-intensive tasks will end up in being sluggish. But a moderate amount it can handle. For storage, it is armed with 1TB hard drive with a spindle speed of 7200RPM. Now for most standards that’s decent especially for data-hogs with intentions of storing large data files, music, multimedia, and games. Basically, it will serve the casual user very well. The system comes with a Windows 10 Home operating system and the system loads from the hard drive. If you value speed over storage, upgrading the storage with a 256GB solid-state drive will really help. It should be able to boost your boot up time to a few seconds and fasten program load times as well. Still, if you don’t have the extra cash for that, it should work just fine. Don’t worry about it. The Pavilion 570-p030’s Intel Core i7-7700 processor coupled with 12GB RAM can hold its own as a multitasker. For that, we easily recommend it for general tasks both in the office and at home. Other additions like the USB Type-C are emphatic strides towards the future which make this PC more marketable to budget-conscious home users looking in the market for future-proof PCs. 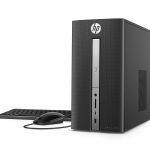 To sum it all up, if you don’t mind owning a desktop with a subtle design, the HP Pavilion 570-p030 desktop is a recommendable choice. It packs the robust power to handle all your run-to-the-mill tasks at once or simultaneously; a bona fide multitasking powerhouse. For that, it easily receives our Editor’s Choice for general use desktop.